CANTON, Mass. 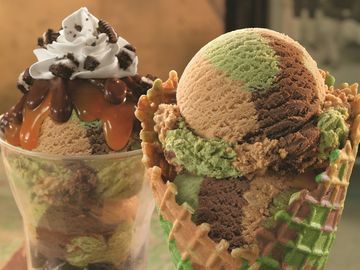 (February 28, 2012) – Baskin-Robbins, the world’s largest chain of ice cream specialty shops, today announced 3-Point Chocolate as its March Flavor of the Month. A triple threat of chocolate flavored ice cream with a salty caramel ribbon and orange colored caramel pretzel balls, this sweet indulgence is the newest addition to Baskin-Robbins’ flavor library and will debut in Baskin-Robbins stores nationwide this March. March is an exciting time for college basketball fans, and 3-Point Chocolate is a slam dunk flavor for ice cream lovers everywhere looking to celebrate the return of their favorite, annual athletic tournament. The 3-Point Chocolate Sundae is also available all month long as a decadent combination of 3-Point Chocolate ice cream, hot fudge, Reese’s® Peanut Butter Sauce, crushed Reese’s Peanut Butter Cups and whipped cream. In addition to celebrating college basketball season with 3-Point Chocolate, Baskin-Robbins stores are offering customizable ice cream cakes for select college basketball teams. Custom cakes can be ordered in advance at participating Baskin-Robbins shops. Named the top ice cream and frozen dessert franchise in the United States by Entrepreneur magazine’s 31st annual Franchise 500® ranking, Baskin-Robbins is the world’s largest chain of ice cream specialty shops. Baskin-Robbins creates and markets innovative, premium ice cream, specialty frozen desserts and beverages, providing quality and value to consumers at more than 6,700 retail shops in nearly 50 countries. Baskin-Robbins was founded in 1945 by two ice cream enthusiasts whose passion led to the creation of more than 1,000 ice cream flavors and a wide variety of delicious treats. Headquartered in Canton, Mass., Baskin-Robbins is part of the Dunkin' Brands Group, Inc. (Nasdaq: DNKN) family of companies. For further information, visit www.BaskinRobbins.com.